No need for a guide to follow these experimenters of sound and melodies. They will guide you through the byways they take, even though some get confused. Exploiting all the liberties that a group without harmonic instrument can offer, Collapse develops a completely original musical world through their own compositions. Collapse is probably one of the brightest young jazz bands of these past few years. Each member has already played with different bands in electro, blues, rock, Latino and a big band. Favresse and Deval set the tone with the compositions. Peeters brings his sensibility while the younger Estiévenart brings inventiveness and a sound picked up playing with Al Orkestra and Joe Higham, notably. The group was formed in 2006 as Collapse and, despite the name, it is not falling apart – quite the contrary. They chose to bypass the harmonics of the piano - like the quartet of Ornette Coleman on “Tomorrow is the Question!” This indicates the freedom the musicians grant themselves, the freedom to go where they please. 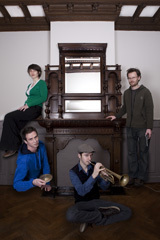 They mix the roots of jazz, bop and free jazz with Arabic, Balkan and Klezmer influences. It’s exciting, full of originality, dynamic and sparkling with bubbles of subtle inventiveness like quality champagne.